Take a moment to sit down and write it down – Write with us! 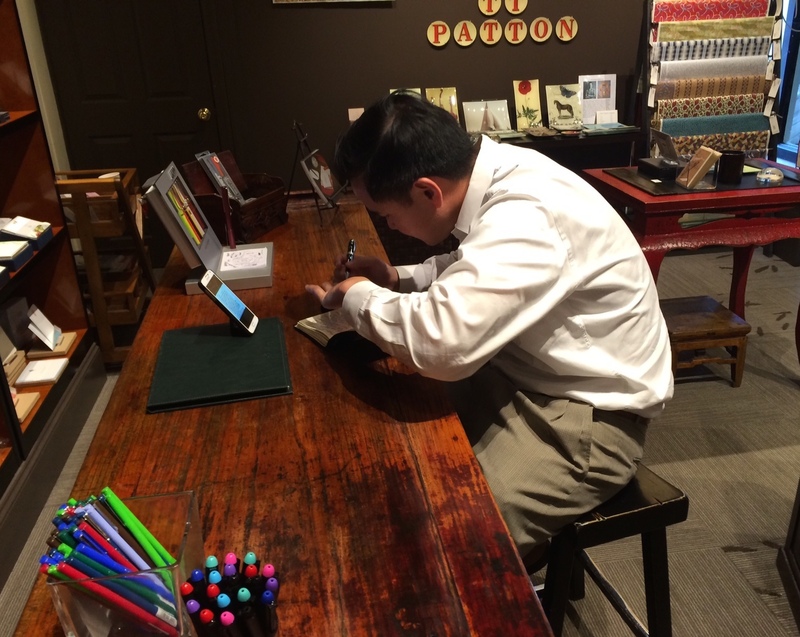 A local banker stopped in today to purchase a journal for his niece that is starting college. He wanted it to be a keepsake, but he really wants her to write in it versus treating it like a photograph, only offering a quick glance on occasion. We all have journals and other items that we look at from time to time instead of using them. So after we picked something appropriate for her, I suggested maybe he write her a note on the first page, be the first entry. Maybe a nice congratulatory message or something that encourages her to follow her dreams. At first he thought he’d email her a quote later….then he changed his mind. He found the quote on is phone, propped it up and sat down and wrote the entire journal entry here. He’s feeling pretty good about this little journal he purchased today. Well, now it’s not just a journal, it’s a special note of encouragement….that his niece will keep forever. And maybe she’ll walk by it occasionally, pick it up, add to it, or at least read his words of encouragement. Now that’s a gift. Previous Post What’s keeping you from writing?